Why Have Scientists Creating Shapeshifting Food? Apart from the novelty, is there a practical reason to create food that’s capable of changing shape? That’s what researchers at MIT’s Tangible Media Group have done. In what’s been called “culinary performance art”, a shapeshifting pasta concept may be more than just novel, it could transform the way food is processed, packaged, and shipped. After calculating just how much air remains in a perfectly packaged container of pasta, research coauthor, Wen Wang and her team looked at ways they could temporarily modify the shapes for more efficient packaging. By creating flat sheets of gelatin and starch, the team found a way to create various forms that do not appear until after the food is submerged in water. “We thought maybe in the future our shape-changing food could be packed flat and save space.” she said. Their food creation was inspired by a bacterium that changes shape when subjected to moisture. The bacterium, Bacillus subtilis, is also used to ferment nattō, a traditional Japanese dish made from soybeans. The team decided to use 3D printed layers of edible cellulose and gelatin combined with bacteria to create different patterns. Once the patterns were exposed to water, they took on various shapes, transforming from 2D to 3D forms. After the team began working with a Boston-based chef to expand on the pasta design, they created computational models showing transformations and an online interface that would allow web users to design their own custom pasta shapes. When pasta can be packaged flat, regardless of the end shape, that could mean smaller packages and reduced use of materials for the same quantity of food. That then means a greater number of units packaged and transported with each shipment. 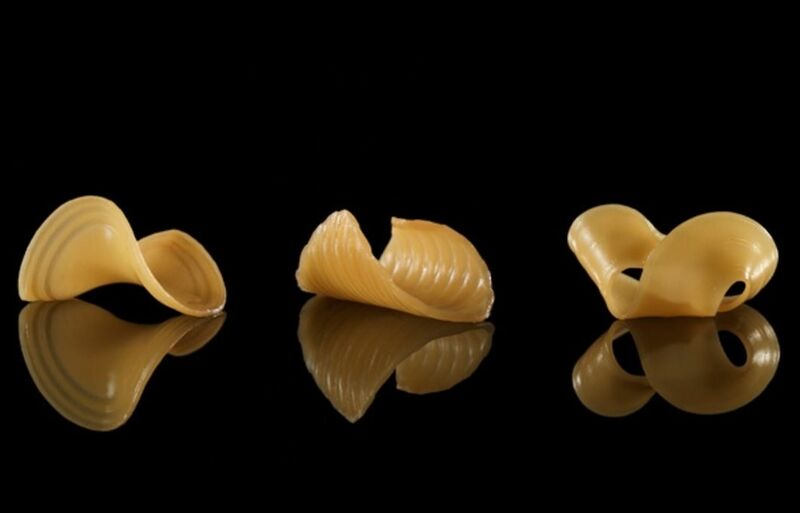 In addition to benefits for packaging and shipping, the shapeshifting pasta could lead to novel and interesting culinary experiences. The team also created noodles that could tightly wrap around small ingredients like beans and small quantities of caviar, automatically, and fettuccine that could spontaneously separate when submerged in broth. What are your thoughts on this interesting pasta development? Comment and tell us.